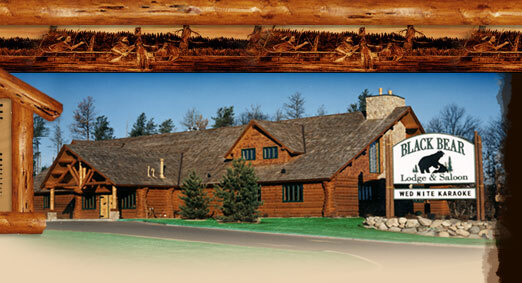 If you decide to have a hand-scribed log home built for you and you want a large company with a sales department, an accounting department, an engineering department, a drafting department, a large work force and all the amenities you could possibly think of, then do not contact Lloyd Hahn, owner of Mountain View Log Homes, (406) 754-2228. 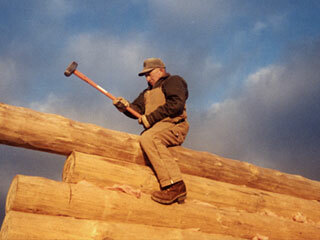 Lloyd performs most of these functions himself on the kitchen table of his northwestern Montana log home. Lloyd is a former outfitter & hunting guide who escorted pack-horse hunting trips into the Bob Marshall Wilderness area of northern Montana for approximately 20 years. Now Lloyd and his assistants, Dan and Scott, build log structures the old fashioned way; one quality structure at a time. 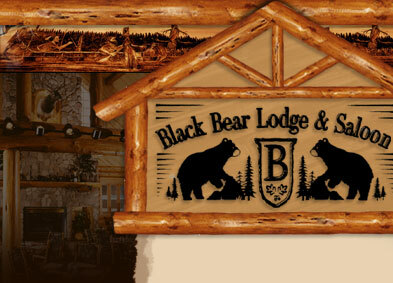 Lloyd, Dan and Scott did a great job building the Black Bear Lodge & Saloon. 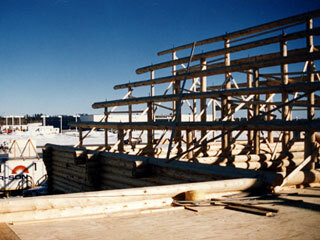 It was built once in Lloyd's Montana yard and re-erected by Lloyd and the crew on our site here in Baxter. It was the ultimate Lincoln Log set! 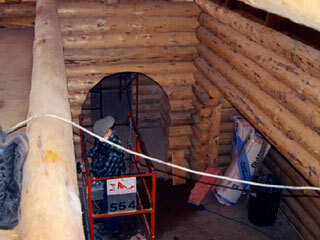 All of the logs in this structure have been peeled with a draw knife by hand. There is a rumor that when a crew of men get together to build a log home, the crew member with the lowest IQ is assigned to the peeling rack. 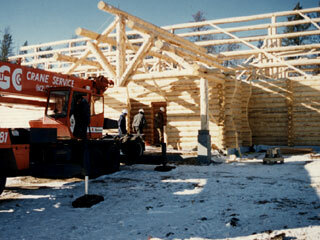 The Black Bear Lodge & Saloon was built from Lodge Pole pine. 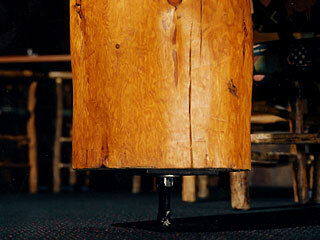 All wood, especially green wood, shrinks when it is laid on it's side. 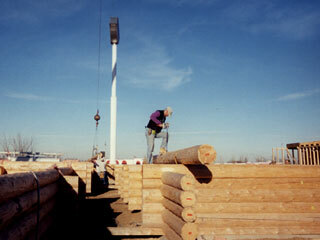 We expect each log to shrink from 1/4" to 3/8" during the first 3 years. 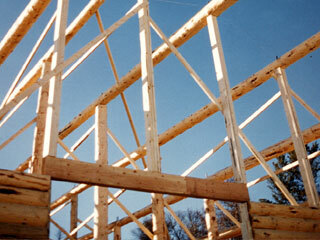 There are 14 logs in the side walls so that means the walls will shrink a total of approximately 5". The ramifications of 5" of side wall shrinkage are immense: The roof will drop 5". 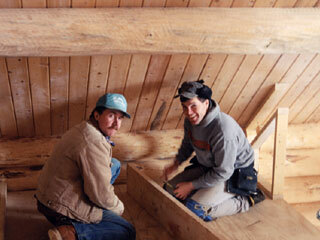 All plumbing and vent pipes must have slip joints if they protrude through the roof. The roof drops but the fireplace doesn't. There must be a slip joint over each window and door. 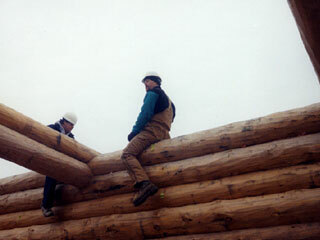 Nothing can be attached to the log side walls unless they have a slip joint designed into them. The amount of side shrinkage must be measured periodically so that the "screw jacks" under the support logs in each room can be lowered an equal amount. When loggers are cutting lodge pole pine trees in Northwest Montana or Idaho for the lumber mill, they put the straightest logs and the logs with the least amount of tapper in a separate pile. 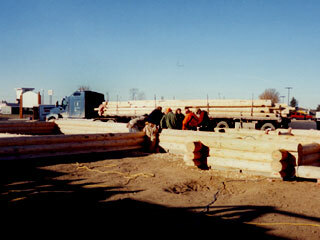 These logs demand a premium price with log carvers and are called house logs. 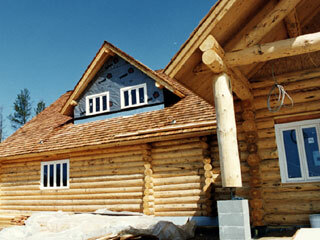 In addition, if the logs are "dead standing" house logs they are extremely valuable. These logs are dry instead of green and will not shrink as much. The dead standing house logs are mostly the result of beetle kill or possibly a fast moving forest fire. If they fall to the ground they are useless since they will quickly rot. The logs that Lloyd used in this building are dead standing house logs. He purchased approximately 150 logs. Many of the wildlife settings have been supplied by Joe Marshall and Northernwoods Taxidermy. 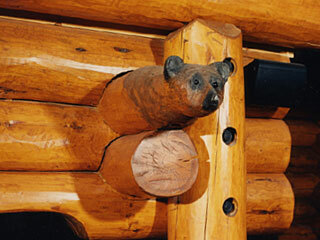 The bear heads on the end of the bar canopy and on the fireplace mantels support logs were carved with a chain saw. One beaver chews down 400 trees a year. They live 19 years and cut down 7600 trees in a lifetime.